..Wee Memories..: Some OVER THE TOP exciting news to share! Some OVER THE TOP exciting news to share! I cant hold it in any longer. It was announced today so now I can post about it. Whew that was hard to hold in. I got a super sweet email from Tami at Hero Arts asking me to become a Hero Hostess and I had to do the happy dance. It really made my day especially after all that we have been going through I needed a good mood lifter. Most of you that haven't regularly participated with Hero Arts flickr group or Hero Arts blog are wondering what this is. I encourage you to check it out HERE on the Hero Arts club blog. And make sure to check out the Hero Arts Flickr group HERE. Hero Arts is one company I cant say enough about. They are so kind and generous. There customer service is over the top and the people that work for and with HA are awesome. They also manufacture their products in the USA. That means allot too. I hope you will come join us on the Flickr group and also check out the contests that Hero Arts holds. They are so generous with their prizes to the winners. Its amazing. Also wanted to share this card I did for my Boss' daughter who is due any moment. Shes expecting a baby girl. I wanted to have this ready to go for when the moment comes. I just saw it over at Hero Arts blog...so happy for you. You'll be a great Hero Hostess! Congratulations Jenny, I'm so happy for you and love seeing your excitement!!! It's funny, I sub to the Hero Arts blog and love seeing creations made with their stamps, but I don't own any myself. One of these days I hope to have a little extra money to try them out!! Congrats, Jenny, you deserved this. Gorgeous card. Lovely stamps, great colors. This is such exciting news jenny you do awesome things with the Hero Arts Stamps and anything you use. BIG CONGRATS!!!! Big, big congratulations Jenny! I'm so happy for you:):)I'm sure you'll have lots of fun in your new apron! Adorable cards! So happy for you...I know how much you love Hero Arts. Congrats! HOOOOOOOLY shnikes! I'm so proud of you! Way to go, Jenny! Wow, well done!!!! I'm so jealous that you'll be stocking your stash with cool Hero Arts goodies. Can't wait to see what you create. So excited for you Jenny!! BIG Congrats! Love both cards! Congratulations, Jenny, you are going to have a blast!! Love the card you made for today! Hooray Jenny :) Cant wait to see what you make!!! Hi Jenny! Love your cards today! Both are so adorable! I'm totally psyched that we get to share in this exciting adventure together! Hugs! Yay, Jenny! Congrats on earning a hostess apron! So happy for you and for Hero Arts! Enjoy the ride!!! Woo hoo, you so deserve it girl! Congratulations! I always love your card designs and methods. Hope to see more in the next few months. Keep up the creativeness and good work! Yay! Congratulations Jenny!! 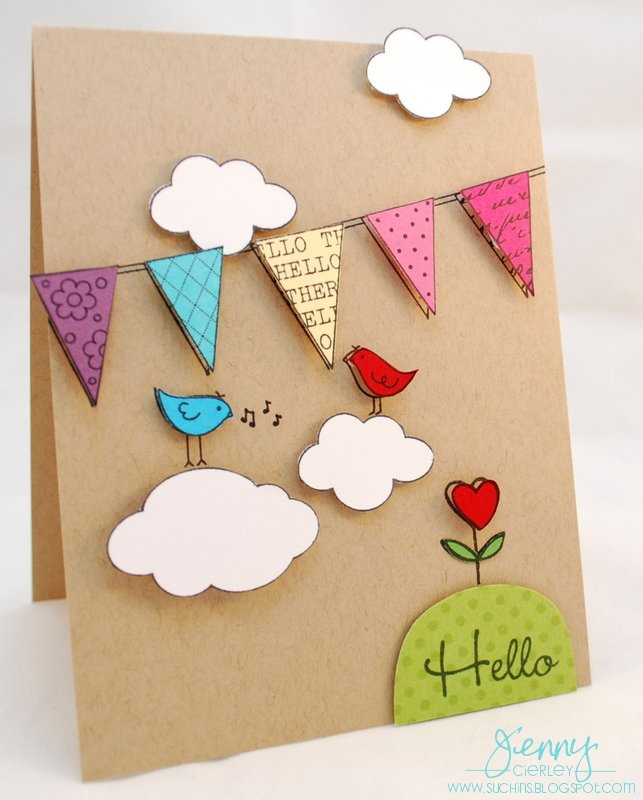 You so deserve this, you are one very talented card maker! Both your cards are so gorgeous as well :) Congrats again! Jenny I am so happy for you! I knew you would be picked! Yay! I love today's cards, so need a baby card right now and that was inspiring! And loved your Hello card too! I can't wait to see all that you come up with! Super duper cards! And so many congrats to you Jenny! What an honor so well deserved, have fun with and and no stress, girl! Just enjoy! Congrats Jenny! Whoo Hoo! Too exciting. Looking forward to your term as a hostess. Congratulations on your wonderful news!! Congrats! Happy for you! Super cute cards here! Thanks for sharing! A Whopping 40 comments? I can see why. This card is stunning. 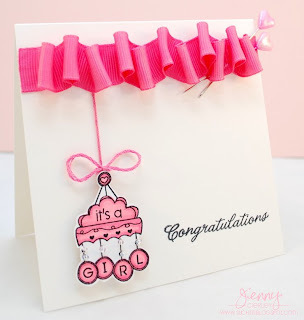 I love the loopy ribbon and how the focus is on the adorable image. Wow Jenny. Wow. OH MY GOODNESS..how did I miss this post with this extra special announcement?! CONGRATULATIONS! Soooo deserved.